It’s been three days since the fire burned out. The friends and relations who helped stoke the blaze have all gone home. Now it’s just the potter and his kiln. Inside, more than a thousand pots, from dainty tea bowls and butter plates to hulking jars, jugs, and planters, await his scrutiny. The potter leans in and extracts the first brick from the kiln door. Then another brick, and another. He’s pulled pots from a cooled kiln dozens of times over the course of some 15 years, but still the procedure puts him on edge. How could it not? Those are his babies inside, fruit of half a year’s meticulous labor, and there are so many ways this can have gone wrong in the violent final stage. The time has come to read what the fire has wrought. 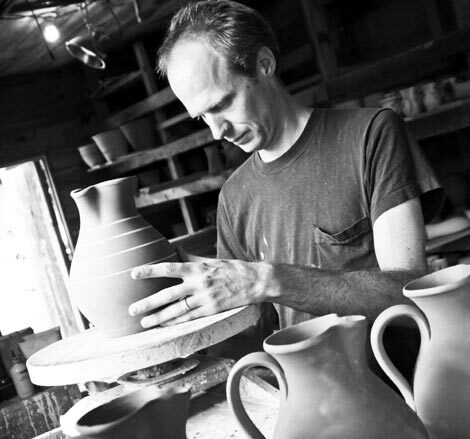 Matt Jones came to ceramics by way of an elective class at Earlham College in Richmond, Indiana. After apprenticing with masters in Cornwall Bridge, Connecticut, and Pittsboro, North Carolina, he moved to a remote parcel west of Leicester, where, a stone’s throw from the 19th-century farmhouse his family calls home, he and a faithful crew of friends constructed his workshop and 600-cubic-foot brick kiln. The Jones clan—wife, Christine, son, Linden, and daughter, Sara Frances—lives just a few miles from the rich alluvial clay seam that provides Jones Pottery’s principal ingredient. He explains that the seam was formed over hundreds of thousands of years by primeval rivers dropping bits of eroded sediment as they wended toward the French Broad and Tennessee rivers. His clay comes from just up the road and across the eons. When it’s time to mix a glaze, Jones could simply drive down to the local ceramics supplier and purchase the necessary components. Instead, he relies on the handiwork of a water-powered mill he built, which uses hydraulic energy from the creek behind his house to convert beer bottles, pickle jars, and creek sand into the crushed glass powder that forms the body of his glazes. Modeled on a device that was used in the old-time potteries of Georgia and the Carolinas, “The Crusher” brings to mind an outsized Dippy Bird. Its three-pronged rebar beak does the crushing, and achieves perpetual motion by playing the weight of water and force of gravity off of each other. While Jones goes about his work—digging clay, throwing pots, sketching motifs—The Crusher goes about its own, slowly and deliberately, 24 hours a day, seven days a week. The kiln is fired twice a year with slabs of pine and poplar culled from the scrap piles of local sawmills. At the outset of a firing, cross-hatched stacks of wood head-high stretch the length and width of the pole barn that houses the kiln. At the conclusion, scarcely a shaving remains. Pinched at either end and plump in the middle, the kiln roars like a jet turbine when it’s fired, bathing the pots in flames. What would seem like a fairly straightforward task—stoking a fire—requires alert, round-the-clock supervision. On the five-day march to 2,300 degrees and back, the heat must be stepped up and then stepped down in carefully controlled increments, lest the pots fracture. Hence the many recruits on hand to help out; hence the digital pyrometer, which dangles above the operation like an IV. Relinquishing half a year’s work to the brutal whims of flame would seem unnecessarily nerve-racking. If you ask Jones why he insists on doing things the older, more demanding way—why not buy his glaze ingredients, and zap the pots with predictable electric heat?—he speaks of wanting to produce work that is both contemporary and solidly rooted in the past. “Pottery is the record of many thousands of human voices from all over the world using the materials at hand,” he says. “With native intelligence and keen, perceptive eyes, old-time potters addressed the simple needs of local populations.” Much of what Jones does, and the way he does it, pays homage to the ceramists who came before him, resourceful craftsmen whose wares were used for pickling vegetables, storing grains, and conveying drink. When all the bricks have been pulled, the potter steps inside the kiln and, with shovel and wheelbarrow, begins to clear a path through the blanket of ash and smoldering embers. Breath suspended, brow dropping sweat in the 200-degree heat, he approaches the stack. He takes a large bowl into his hands, tenderly but assuredly, as though it were a vulnerable newborn babe. For more, visit www.jonespottery.com. See Jones’ work at the annual Come to Leicester Studio Tour, August 18 & 19. Visit www.come toleicester.com.